The music rag Magnet is my absolute favorite magazine in existence today. But one of its columnists, Andrew Earles, seems to have gone a bit off the deep end in recent years. I really don't like a lot of his "street team" writing. That's why I was skeptical going into reading his new book, Gimme Indie Rock. It's a survey, or his opinion, of the 500 best indie rock albums since indie rock began, according to him, in the late 1970s. Or more accurately, Earles only includes albums between 1981 and 1996, no matter how much it pains him to leave out the one classic Feelies album. He rightly describes indie rock as a combination of pop hooks and sonic distortion. 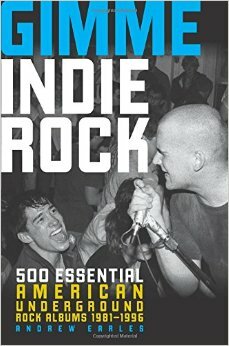 He also notes that the true heyday of indie rock was 1986 to 1996, also something I agree with largely. The book is laid out alphabetically. And when I started reading and listening to the music Earles suggested, I was pleasantly surprised to find that he was suggesting a lot of indie bands I had not really listened to. And several of them are so good that I'm rushing out to buy this book. I love his writing style in Gimme Indie Rock. It's nothing at all like his column in Magnet, which is the only thing I skip in the magazine each month. The first album Earles lists is by 100 Flowers, which he compares to Wire, the Mekons, and Alternative TV. I only really like Wire of those three, but this self-titled 1983 album is really good. I am a huge fan of Slint, which Earles accurately compares A Minor Forest to. So it's really surprising that I never heard the album that he suggests. Moving on, the next band is Adickded, which is a noisy punk trio of Pacific Northwest women, also equally surprisingly good. Shortly after these reviews, Earles gives multiple-album credit to some of my favorite bands, like Afghan Whigs and Archers of Loaf. So even though he says that some of the bands and albums included are not necessarily his favorites or the most influential, he's really done his research. It's really impressive, and I hope to find a couple of hundred albums out of the 500 selections he examines to add to my library. Thanks again Magnet, as always.